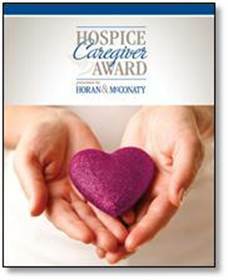 In January, the Hospice Caregiver of the Year will be announced at a banquet honoring the twelve monthly winners. The Caregiver of the Year will win a trip for two within Colorado. Do you know a caregiver who comforts, is kind, empathizes and is caring? At Horan & McConaty Funeral Service/Cremation, we have tremendous respect and appreciation for our community of hospice caregivers. This may be a hospice professional- physician, nurse, chaplain, social worker, CNA, a healthcare administrative professional, volunteer, or anyone else who is seen as an important caregiver in our community. We’re looking for caregivers who, despite the challenges and obstacles, are a shining light of comfort for their patients and those they serve. Each month we will honor a caregiver based upon a review of nominations received from peers, friends, patients and their families, and others who feel a particular person excels in her or his profession. The monthly winner will receive a gift card that can be used for whatever the recipient decides and an award. Please use the below form to nominate and recognize an important caregiver, so we can honor that person through recognition and a special gift. Please call Jennifer McBride, M.A., F.T., at (303) 577-6057 for more information. Please provide complete contact information for the Caregiver you are nominating.